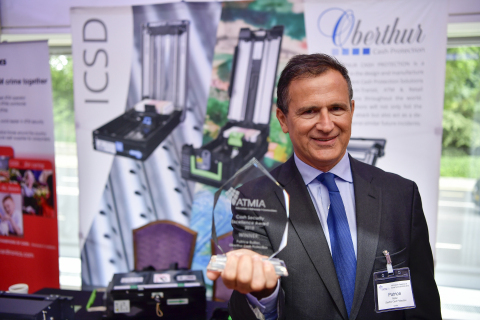 The winners of the Security Awards at ATMIA Security 2018 were announced on June 12th at the ATM Customer Experience & Security Summit (ACESS) in London. Oberthur Cash Protection and its Managing Director, Patrice Rullier were awarded the Cash Security Excellence Award 2018 for their distinctive and long-term contribution to the protection of cash, both in ATMs and transported by cash-in-transit companies. “The three judges for the 2018 security awards were unanimous in their view that Patrice Rullier has made a significant long-term contribution to the security of global cash through directing his company to implement products which act as a huge deterrent to cash crime,” commented Mike Lee, CEO of ATMIA. OBERTHUR CASH PROTECTION designs and manufactures intelligent cash protection systems and security solutions for the Cash-In-Transit, ATM & Retail markets throughout the world. Our systems use technology to detect an attempted attack or theft, and protect cash by permanently marking it as stolen, rendering it valueless. More than 60000 systems all over the world protect billions of banknotes and millions lives daily. The ATM Industry Association is a global non-profit trade association with over 11,000 individual members in about 70 countries. Its mission is to promote ATM convenience, growth and usage worldwide, protect the ATM industry's assets, interests, good name and public trust; and provide education, best practices, political voice and networking opportunities for member organizations.